from 40 pcs. 0.39 CHF ea. from 80 pcs. 0.36 CHF ea. The convenient solution if you want to glue on a disc magnet. 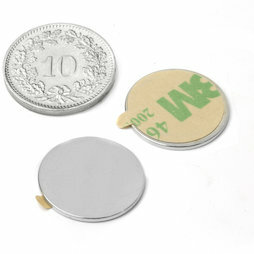 This is a very flat disc magnet (18 mm diameter, 1 mm thin) with a self-adhesive side. Simply remove the film and it glue on.